Today, Heroes of the Storm is launching both a 50% bonus XP event and making every single hero in the game temporarily free to play. What better time to post another of my personal builds? This time, I’ll be looking at everyone’s favourite Zerg, Abathur. Just remember: Sluggin’ ain’t easy. Abathur is one of the most unusual and challenging characters in Heroes of the Storm. I won’t claim to be an expert, but with much practice, I have at least reached the point where I can play him competently. Abathur cannot fight directly. His damage and health are all but nonexistent. Instead, he contributes by placing a symbiote into allies to cast abilities through them, by placing toxic nests (landmines) around the map, and by spawning locusts to push lanes. He requires very strong map awareness and decision-making abilities. General thoughts: This build focuses on using symbiote to enhance your fellow heroes. 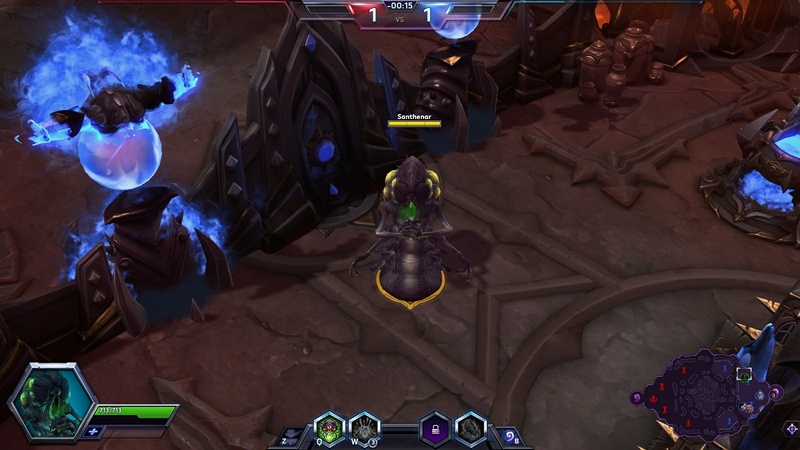 Abathur has no mana and short cooldowns, so you can use your abilities quite liberally. Stab is your core ability, allowing you to dish out some pretty heavy single-target damage. Spike burst is your AoE, but the cooldown is short enough to use it on single targets if you think it will help. Use carapace to shield allies when they’re under attack. Your ideal symbiote target is melee with a strong auto-attack and/or enough toughness to survive in the middle of battle. The range on Abathur’s abilities is somewhat short, so melee heroes allow you to make the best use of them, especially in the early game. That said, it depends on the situation. If a ranged hero needs your help, help them. You need strong awareness of the whole map, and you’ll have to jump around to wherever needed. 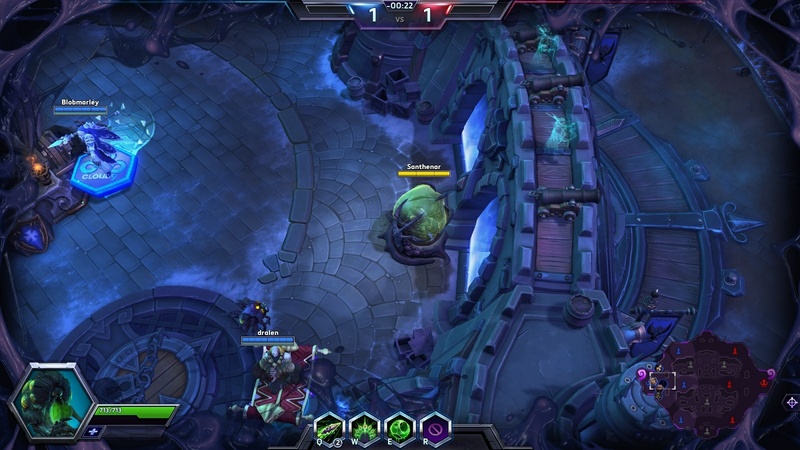 Map awareness and snap decision-making — this is the core of Abathur. You won’t often use symbiote on minions with this build, but if there’s nothing else demanding your attention, go ahead. You can still do some decent pushing with this build. Use your toxic nests while waiting on symbiote’s cooldown. Use them for map vision by placing them in bushes and other important spots or in lanes to soften up enemy minion waves. The only time you leave your base with this build is when you want to humiliate the enemy team by slapping their core into submission. Locusts are another thing that aren’t too important to this build, but stay in one of your outer bases to get the most use out of them. Retreat to another fort or the main base if your location is getting pushed too hard or Nova or Zeratul have found you and are out for blood. Above all, don’t risk yourself unnecessarily. Locusts help push a little, but it’s not worth putting yourself in danger to maximize their use — not with this build. The nice thing about this build is that, with good play and a little luck, you can avoid dying entirely. 1: Pressurized Glands: Increases the range and decreases the cooldown of spike burst. I used to favour regenerative microbes on this tier for a really long time, and it’s still not a bad choice if your team has no support, but the healing from it is rather weak, and I’ve come to the conclusion the extra range on spike burst is usually more useful. It helps you clear minion waves more easily, it allows you to get some use out of spike burst even when you’re infesting a ranged hero, and it’s useful in dense team fights. The reduced cooldown is just gravy. Also note that spike burst is not stopped by walls like stab or any other skillshot would be. On very rare occasions, you can secure otherwise out of reach kills this way. 4: Adrenal overload: Symbiote host gains 25% attack speed. Ideally you want to use this on a hero with a strong auto-attack. Adrenal overload on an Illidan, Butcher, or Thrall can get really terrifying. It also works on minions and mercenaries. That doesn’t come up much with this build, but if you have the chance, infesting siege giants can get interesting. 7: Needlespine: Significantly increases the damage and range of stab. Stab is your bread and butter damage ability and the heart of this build. Its damage is high to begin with, and with needlespine, it gets quite scary. 10: Ultimate Evolution: Clone an allied hero and control it for a short time. The clone has increased damage and movement speed and access to all basic abilities, but not heroic abilities or talents. 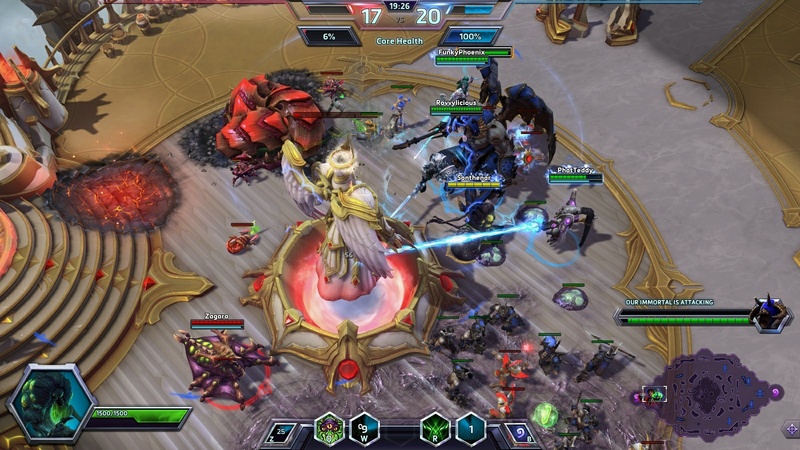 One of Abathur’s greatest disadvantages is his lack of presence in team fights. This talent allows you to address that, while opening interesting options for unique synergies from having two of the same hero on your team. It also has a fairly short cooldown, meaning it’s almost always available when you need it. 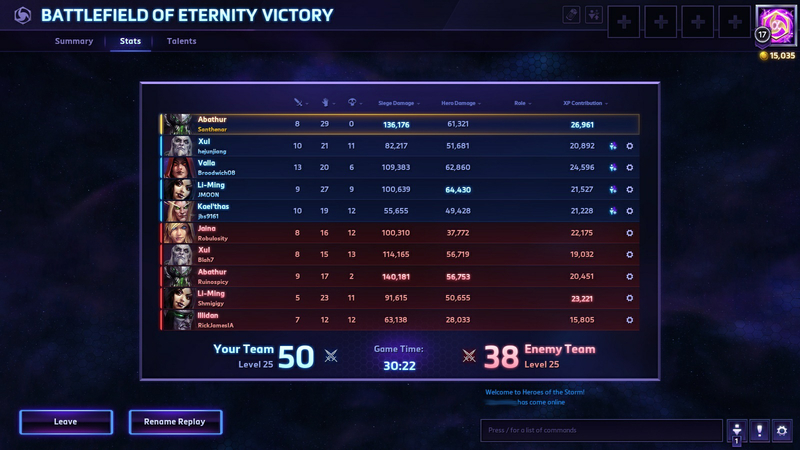 However, this ability is one of the main reasons Abathur is such a challenging and unusual hero to play. To effectively use this heroic, you need a basic competency with at least a majority of the game’s heroes in order to both know who to clone and how to play them to best potential once you’re cloned. Raynor is always a good choice. His strong damage and survivability are always welcome, and it allows you to get double use out of his group buff. Double Jaina is also a strong choice because they can both benefit from each other’s chill effects. If you’re pushing a base, double Hammer is downright terrifying. It can also depend on your own personal skillset. It’s better to clone a slightly less powerful hero that you’re good at than a superior hero you don’t know well. There is no single right answer about who you should clone. It all depends on who is available, who you’re good at, and what the situation is. Because dying as a clone doesn’t count as a hero kill or negatively affect Abathur himself, you can afford to take risks and play very aggressively, but don’t waste your clone’s life too recklessly. Best to get as much use out of it as you can. The lower the clone’s timer gets, the more reckless you can be. You could also take the other heroic, Evolve Monstrosity. You can do some impressive siege damage with it, but it’s still fairly difficult to maximize its effectiveness, requiring lots of baby-sitting and very strong map awareness, and it’s pretty easy for the enemy team to counter if they’re on the ball. 13: Spatial efficiency: Stab gains an additional charge. Again, stab is the heart of this build. An extra charge of it is most welcome. 16: Adrenaline boost: Carapace significantly increases the movement speed of its target for a short time. This another of those talents I like because it has both defensive and offensive applications. The extra movement speed can help a low health ally escape, or serve to close gaps with the enemy team. 20: Hivemind: Symbiote affects a second nearby hero, mirroring the abilities used by the first. This is another complicated talent. Double spike burst and carapace are easy, but double stab takes some careful aiming. Not too hard once you get the hang of it, but it’s a bit unusual and takes some getting used to. The good news is double stab at level twenty hits very hard, and adrenaline boost applies to both carapace targets. The other tricky thing about this talent is that it steps on your ultimate a bit. Both are aides in team fights. It can be quite difficult to determine whether you want to clone an ally or just stick to symbiote, unless you need the specific specialties or utility of a hero (like Hammer for pushing). However, despite its complications and difficulties, I still think hivemind is the best option on the tier for this build. The power it offers is too good to pass up. As an aside, I finally got enough people to use my recruit a friend link to unlock my vulture mount. My thanks to everyone who helped me out with this. 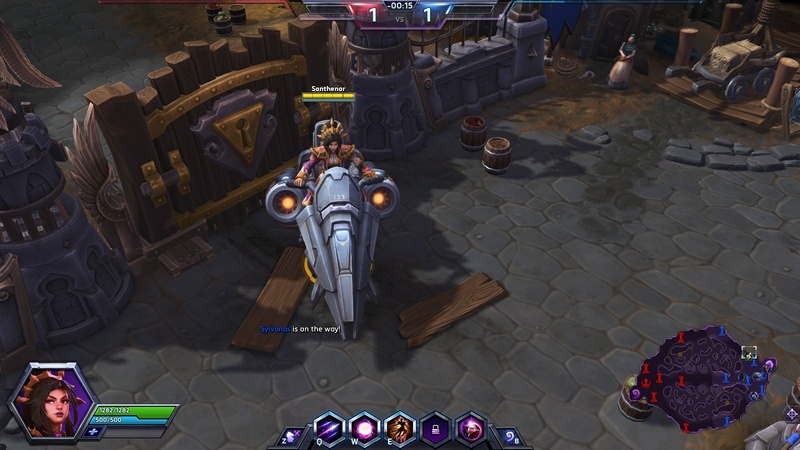 Of course, now Tracer is coming out with another awesome hoverbike mount. Sigh… you got me hook, line, and sinker, Blizz.